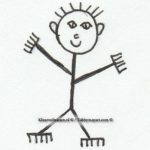 This article was originally posted by Nerine Martin on ColorYourWayToHappy.com. Copyright is such an important subject, with so many people downloading drawings from Pinterest and Google, that I felt the need to share it on my own website. Shared with Permission from a passionate Artist….. There seems to be a lot of confusion amongst colorists about copyright and how it applies to coloring books and pages. Most people who break copyright law have good intentions, so I am writing this to clarify some issues about copyright of coloring images that I’ve seen come up multiple times, both with colorists and artists. Copyright allows you to color images you purchased for personal use. If you want to share a free page, share a link to where the artist posted it so others can visit their site and get it themselves. Wrong! Remember Napster? There was sharing, no money being exchanged, and they credited the artist. It was still illegal. You didn’t create the coloring sheet, so if you distribute original work that is not yours, you are breaking the law – even if you credit the artist. This is like showing up at someone’s office, taking their paycheck and giving it away to other people because you love their work. If you give away a copyrighted image, the people who use it won’t be running out to buy the coloring sheet(s) they just got for free. If you are a fan and want to publicize an artist’s work, the best thing you can do to support this artist is to share your colored work with the artist’s name and where you got the original from (such as the name of the artist’s book or their website). Usually colorists want to know where a colored page is from and what media was used to color it, so you might as well answer the question when you post the colored image. Copyright prohibits any distribution or reproduction of the original work. When you buy a movie or a CD it doesn’t give you the rights to burn copies and give them away or post it online for others to download – the same rule applies to coloring sheets/pages and books. Personal use means for your own use. If you want to give away a copy to a friend you need to give them your original physical page that you bought or buy another book to give away. As with any physical object, you need to purchase it every time you give it as a gift. So yes, you may cut out an original uncolored (or colored) page out of a physical book you purchased and give it away, but not copy it or scan it to distribute. You also should not share an electronic file you purchased (i.e. PDF file/ebook). If you want to share a file with a friend or give it as a gift, you need to purchase another electronic copy or ask your friend to purchase their own copy. Most of the “free” coloring sheets posted online and on Pinterest are unfortunately stolen from artists. Coming across a bike without someone’s name on it doesn’t mean that it’s yours. As with any other item, just because it isn’t labelled doesn’t mean it belongs to you. We are adults and are well aware that the Internet is not a game of “finders keepers”. You can trust images posted by the artist as a free download or sold from their facebook page or website. You probably have not noticed that all images in Google search results have a warning: “Images may be subject to copyright” – so the argument that they’re free of copyright because you found them on Google or Pinterest is invalid. Using the words “Credit to the artist” when you post copyrighted work does not mean you’re not breaking copyright law. Artists today need to post their work online to promote it – that does not mean it’s OK to steal it. You don’t steal store displays – the same applies to an artist’s online presence. When someone is ill, it doesn’t mean they can just grab items from the grocery store shelves and not pay for them – copyright laws apply to everyone regardless of their health condition. Check with your hospital or doctors. 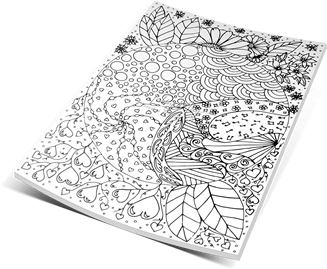 Many artists generously donate coloring pages/books to cancer centers and other medical offices to be used by people undergoing chemotherapy, dialysis and many other medical procedures. This is not a victimless crime. The cliché about starving artists rings true because art is generally not the most profitable profession out there. Coloring book authors are real people struggling to pay bills and feed their families. Many are single parents, have disabilities that keep them from being able to work outside the home, or have health issues that keep them from being able to work in a regular office environment. Some work full time and stay up late after they get off work, and their children are in bed, and lose sleep to work on their material – hoping for a little side income to help make ends meet. Art may look easy, but there is a lot of work and expense that goes into it. Expenses include pens, papers, markers, pencils, erasers, scanners, computers, cameras, printers, and software. Add to that the time that it takes to research one’s subject, draw a coloring sheet, clean it up, get it ready to publish (and to learn how to publish in the first place), and either get it formatted for a book or on an online store, publish or post for sale, plus the extensive time that goes into marketing one’s work, and in the event money is made – bookkeeping time and expenses. This doesn’t even include the time it takes to learn to draw the art itself, through hours of grit and hard work, or the bills related to art classes and college courses. People tend to think artists are born with this innate talent, but no one seems to notice the countless hours they spend honing their skill. As any artist who ever figured out how to draw lips, hair/fur, eyes, hands, or a landscape that looks 3-dimensional instead of flat can attest, there is real struggle and work involved in learning to make art. It’s fine to post your coloring work in progress or finished coloring sheet. Just cite your sources for each picture posted. 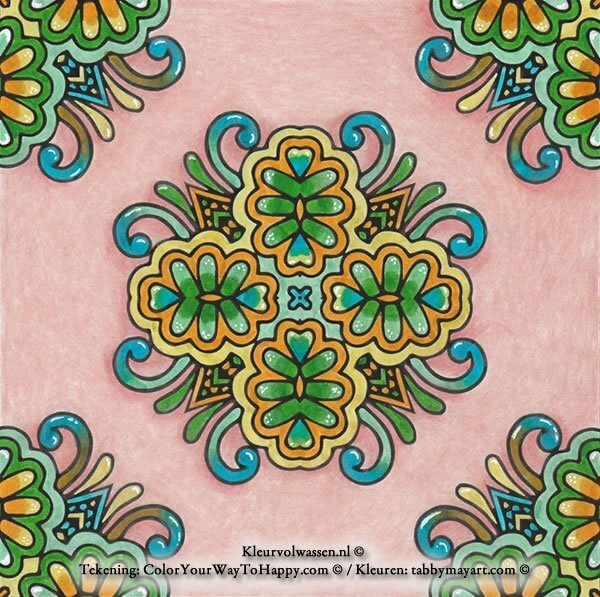 Coloring should be fun and relaxing. Drinking is legal; drunk driving is not. Police are not killjoys for arresting people driving while intoxicated, and neither are artist’s killjoys for protecting their copyrighted work and source of income. You can buy coloring books (they truly are everywhere now – bookstores, supermarkets, dollar store, you name it), or download coloring sheets from the artist’s online store. If you’re on a tight budget, look at the artist’s page for free samples, or ask your friends and family for coloring books as gifts. Don’t download from Google, from any sketchy web sites full of free coloring pages (particularly foreign ones – you may end up with viruses and spyware in addition to stolen images), and don’t download from Pinterest. Those easy rules of thumb will keep coloring fun and stress-free, like it’s supposed to be. I am addressing copyright because I have seen several coloring book artists leave the field or become discouraged because of art theft. If you believe artists are killjoys for talking about copyright, then I imagine that if someone steals your wallet you would not call the police so you don’t ruin that person’s fun. Artists enjoy sending takedown notices about as much as you’d enjoy filling out a police report after someone stole your property. I’ve seen several artist friends find out their work has been stolen and have seen their reaction: shock, grief, frustration, anger, helplessness. Many hours are used up dealing with the incident and some are not able to draw for days or weeks after. I know those feelings well because that’s exactly how I felt after my home was broken into and after my purse was stolen. It grieves me to see my friends feel that way. Why have fun at someone else’s expense? Let’s keep it legal! 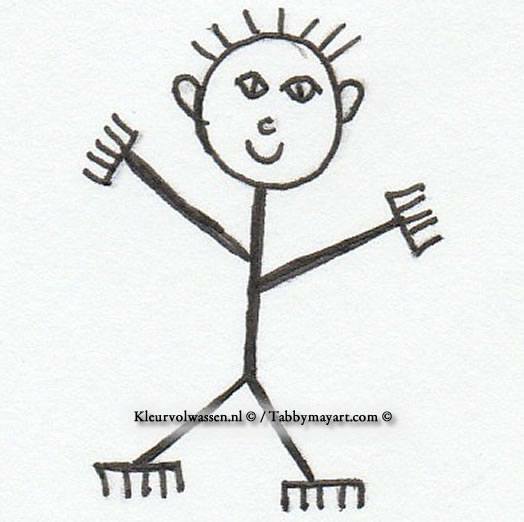 Otherwise we may all end up coloring stick figures – and where’s the fun in that? 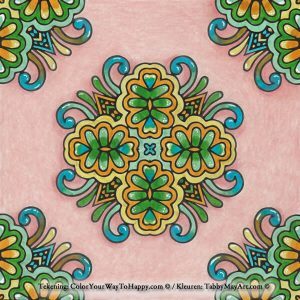 Keep coloring enjoyable for yourself (guilt free!) and for the artists so we can work together to do what we love: color and relax! When I asked Nerine permission to translate her article to publish it on Kleurvolwassen.nl, she sent me a lovely email in return with the link to a sample coloring booklet with drawings she has made for her own coloring books that are already published (also available on Bookdepository.com). The colored drawing in this article came from this booklet. Click here for your own free copy. Thank you so much for all the info!! I’ll pass this along to people I know that use Pinterest and Google. Great information!! Thanks for spreading the word JoAnn!